Aaron O’Connor believes he is almost back up to full speed after a frustrating season so far with Kettering Town. 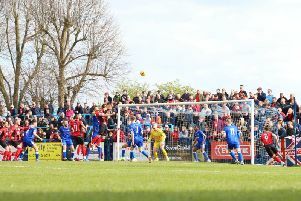 While the Poppies have mounted a title challenge in the Evo-Stik League South Premier Division Central, they have had to do a large portion of it without the experienced frontman who hit 40 goals in all competitions last season. O’Connor missed the first three months of the campaign after suffering a serious knee injury in the final pre-season friendly last summer and has been working his way back to full fitness since marking his return with a goal in the 3-0 success at Needham Market in November. He has been in and out of the team in that time but in the last couple of weeks, the signs have been there that he is back to his best. He grabbed a late equaliser in the 2-2 draw at Coalville Town and, last weekend, he hit the only goal of the game as the Poppies beat Royston Town 1-0 at Latimer Park. goal against Royston was his sixth of the campaign. “I have to give the gaffer (Marcus Law) credit because we knew the only way to build it back up was to be playing games and he put me back in there. “But it came to a point where I knew my performances weren’t quite where they needed to be and I had no issue when I was brought out of the team for a few games. “It just made me work even harder on my rehabbing and in training and now I feel like I am fully over the injury. “When I may have been at 60 or 70 per cent as soon as I came back, I feel like I am up to the 85 to 90 per cent mark. As part of its ‘Poppies in the Community’ program, Kettering Town are now taking bookings for its February half-term school holiday football course. It will take place on Monday and Tuesday, February 18 and 19 between 10am and 3pm and is open to boys and girls aged between five and 14 years old of all abilities.